At the start of October we performed at the wedding reception of Mark and Carolyn in quite a large marquee in rural Staffordshire. 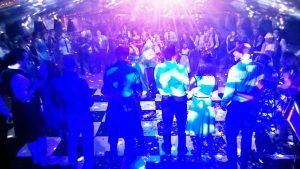 Like many brides and grooms who hire Hard to Handle band, Mark had reviewed our website including our wide range of music and other information and decided to get in touch. Mark had specific ideas about what he wanted, which is always great to hear as we like to think that we are flexible and professional enough to work with clients to exceed their expectations. On the big day, we pulled out all the stops to ensure that Mark and Carolyns’ 200+ guests had the night of their lives. We were even able to work with a last minute request involving some ukuleles! Mark got in touch the very next day and told us, “you were on great form last night!” Yes we were, and always are in fact! We love playing to all sorts of people. From small groups of 20 through to 200 or more people, our aim is to entertain, and as a professional live band with literally hundreds of gigs’ worth of experience, we’re perfect for creating that “wow” factor. Interested? Just call us direct on 0796 433 5657. We look forward to hearing from you!